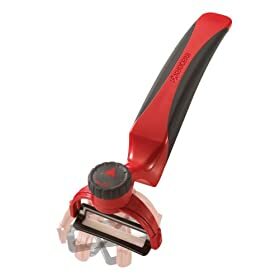 The Kyocera Perfect Peeler is a great example of a well-designed tool that you can find in a kitchen. It’s well designed from a usability and a materials perspective. The Perfect Peeler has cutting blades that are made from advanced ceramic, which stays sharp longer than steel, won’t rust, and won’t leave a metallic taste in the food that you peel. You can also be pretty creative about how you cut. This tool cuts vertically, horizontally, and diagonally. Kyocera purchased this design from Trident-Designs, which makes some pretty cool stuff. Check out the PowerSquid 5-outlet device if you don’t believe me. This food peeler is best for peeling fruit like mangoes and kiwis. I’m not sure how it performs on tougher vegetables like potatoes and squash. The Perfect Peeler is a great tool for any bachelor to have in his kitchen. You can slice through skins with ease and it looks just as impressive as it performs. The red and black colors are very manly and let people know that you’re not just peeling something–you’re doing it with style, ease and perfection.